In Rick Riordan’s book, The Lightning Thief, Percy and his friends are enticed by the glitz and glamour, food and frivolity in the Lotus Hotel and Casino, emerging from trance-like states five calendar days later, much to their dazed surprise. If you’ve ever experienced Las Vegas, you know that once you fight through the haze of smoke and reverberating cacophony of ringadings, Lionel Ritchie slow jams, and siren call of the almighty slot machine, you feel like you, too, have lost track of time and days that you can never recover. When we told them we were taking our young, impressionable daughter to Vegas, our family and friends shook their heads in quiet disapproval. We pressed on. To further Indi’s “American curriculum”, we booked into Circus Circus for three nights too long, taking advantage of the free big top shows and the amusement park inside the hotel, riding roller coasters and eating junk food. Since no stay in Vegas is complete without a show, we decided to check out the Mac King Comedy Magic Show at Harrah’s because 1. it was highly recommended and 2. it was cheap. Most of the laughs originated from the ‘ol hidden pocket inside the crotch zipper and, discernment aside, Mac King gets a Windust seal of approval because it was not only cheap—compared to the other options— but also entertaining to all three of us (mostly Indi). Another night, we rode the bus to the downtown area to go where the Rat Pack spent their dough and to check out the Mob Museum, which ended up being ridiculously expensive (so we visited the museum gift shop for free!). Our favorite trip was to China Town to Viet Noodle Bar; the best phở we’ve had in a long time, outside of Vietnam. If we ever return to Sin City, you’ll find us here. We also ventured off the strip to get Jason cleaned up for an interview and headed to Joe’s Barbershop next door to where Indi and Wendy waited patiently at Abuela’s Tacos, chowing down on horchata and breakfast burritos. Thank you, Matt Medina, for Jason’s before and after! The biggest takeaway? We are far too cheap and not nearly fond enough of boozie slushies to truly enjoy all that Vegas has to offer–and Indi has no desire to ever return. Let’s call it a successful early intervention. Next stop: Kanab, Utah for the North Rim of the Grand Canyon and Bryce Canyon and Zion National Parks! You head off to a destination, maybe you’ve done some research–maybe not–and you have this preconceived notion of what it will be like. Then you arrive and realize you were totally wrong. For us, this was Death Valley. Other than the Black Canyon of the Gunnison, Death Valley was probably the National Park we knew the least about prior to this trip. What were we expecting? Searing heat. Sand. Desolation. Flatness. What did we find? As we entered the park, we were greeted with pleasant 80o F (250C) temperatures, almost no sand, a surprising amount of vegetation, and a vast basin surrounded by mountains and canyons too numerous to explore. Initially we had planned on staying in Mesquite Springs campground (another Sunset magazine recommendation), but after consulting our map we felt that either Sunset or Texas Springs would be more convenient for the limited time we had in our nation’s largest national park (1.8 million acres). Upon pulling into Sunset we were greeted to a huge gravel parking lot filled with mega-motorhomes. We inwardly, or quite possibly, outwardly groaned in dismay. However, as we continued up the hill and into the adjacent Texas Spring Campground and were happy to find at least a few trees and a bit more separation between sites. So, we set up camp and headed to the nearby Furnace Creek Resort to check out the visitor center and plan our next few days. Furnace Creek was the site of an old mining community that has now become an upscale-ish resort; complete with cabins, restaurant, pub, grocery store, and the world’s lowest elevation golf course. From here we headed towards Artists Drive Loop, only to arrive and discover, like several other park roads, that it was closed due to flash flood damage. However, on the way back to camp we found the Golden Canyon Trailhead and decided to check it out. We ended up discovering a cool little canyon that became even more dramatic on the way out due to an amazing sunset. This is probably a good time to mention that we’ve never been to a place with more dramatic sunrises and sunsets and this is a case where pictures are definitely worth a few thousand words, I only wish our photography skills could match what we saw in nature. The next day we had planned to start our day in Mosaic Canyon –another amazing hike– walking, and in places scrambling, up a narrow canyon. After our hike, we headed to Badwater Basin. At 282 feet (86 m) below sea level it is the lowest spot in the U.S. By the time we had arrived the wind had picked up, I mean really picked up! We didn’t really expect much visiting Badwater Basin and the salt flats, but once again were blown away (almost literally) by the otherworldly landscape. A short drive away we also stopped at the Devil’s Golf Course where deposits of salt have been sculpted by water and wind to form a sharp and jagged ground that you would not want to trip and fall on. After getting back to camp, we discovered our bins and some other camping equipment that had blown across the campground into some bushes; actually it was the park’s camp host and our neighbors that discovered and returned them to us… camping rookie mistake. The wind was still howling, our Good Samaritan neighbor had a weather station on his motor home and informed us the wind was blowing 40 Knots. We’re not sailors so we don’t know what a knot actually is, but now we know that when you put 40 of them together, that’s a hell of a strong wind (actually Jason did just look this up and 40 Knots = 46 MPH = 74 KPH). Wendy and Indi retreated into the tent trailer, which felt as if it was in jeopardy of being blown over, while Jason turned the truck around to create a wind barrier and moved our stove into the back of the pick-up under the canopy to whip up dinner. 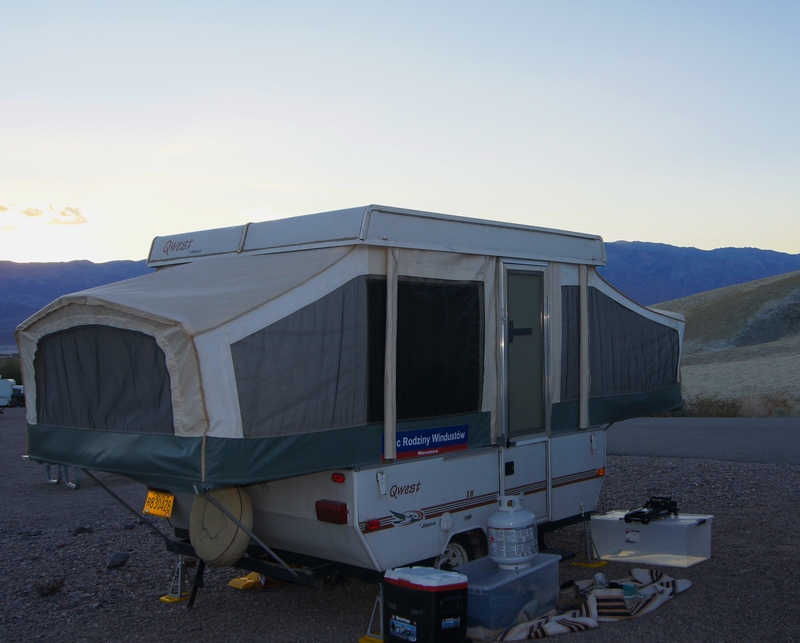 Later in the night the wind did die down and we woke up to rain showers… rain in Death Valley? Yet another preconceived notion blown out of the water. As we packed up the next morning, it was with a little sadness because the rest of this leg of our journey– Las Vegas, Kanab, and St. George– will be spent in a hotel, an Airbnb rental, and with friends, so our camping nights in Trailblazers are finished (maybe for good if we upgrade our trailer over the Christmas holiday back in Oregon). 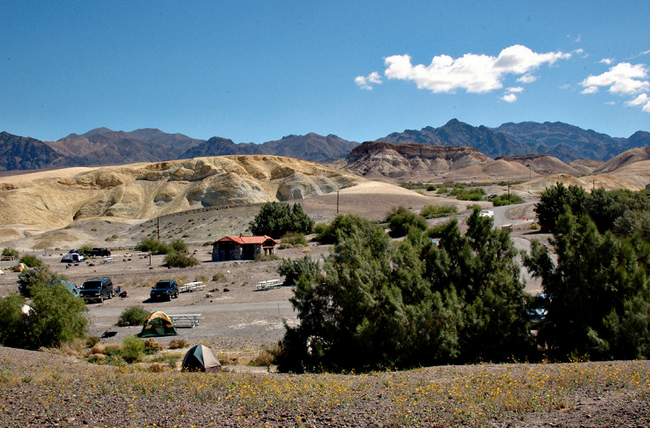 Death Valley gets six huge thumbs up from the Windusts. Next stop: Viva Las Vegas!